About halfway though Chill Penguin's stage you'll see the upgrade capsule right in front of you. Unless you use a password, you cannot avoid getting this upgrade. After the rising/falling platforms you'll come to a tall, skinny wall (it looks like a metal mesh) that you must climb to proceed. If you fall down on the right side of the wall (instead of jumping to the next platform at the top of the wall) you will fall into a small area with a ledge that you need to dash jump to get to. Once on the ledge you will see several flammable containers in the wall; shoot these with any weapon until they explode and walk into the small room to find the upgrade capsule. Near the start of the stage, you will come to a pit that you can enter below you to get a Heart Tank or you can jump the pit to enter what looks to be a cave (the ceiling and floor look much rockier). Instead, climb the wall on the right and proceed ABOVE the cave and you'll come to a small area that will soon be closed off by falling rocks. You have to fight a mini boss (shoot it in the eye to cause damage, Boomerang Cutter works best) to get the upgrade capsule. Near the beginning of Flame Mammoth's level, the stage will force you to go down to continue, followed by a large area with lava on the floor and platforms that the lava will break through (note: the lava will be frozen and can be walked on if Chill Penguin's stage has been cleared). 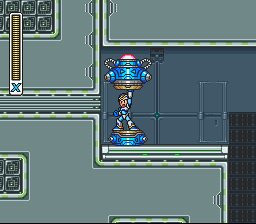 Just before the first platform, breakable blocks can be seen near the ceiling. Dash jump to the blocks and use the helmet and leg upgrades to break them and climb up the wall. The upgrade capsule is in a small room at the top of the wall if you didn't already receive the upgrade in Sigma Stage 1. In Sigma Stage 1, defeat Vile and Zero will give you the upgrade if you didn't already get it in Flame Mammoth's stage. 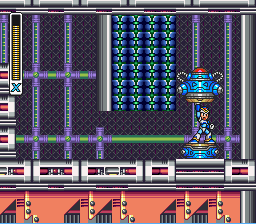 The special thing about this upgrade is that not only do you gain a third charge level for the Mega Buster, but you can also charge up your other weapons and unleash various abilities. 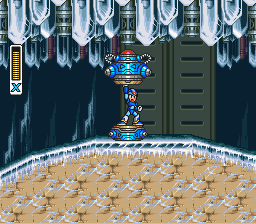 For example, Chameleon Sting's charged attack turns Mega Man invincible for several seconds. Necessary items: All Heart Tanks, Sub Tanks, Upgrade Capsules and boss weapons. As a reference to the Capcom series Street Fighter, a hidden upgrade capsule housing the Hadouken Fireball upgrade was placed into the game (complete with X actually yelling "Hadouken!" in a high pitch voice). 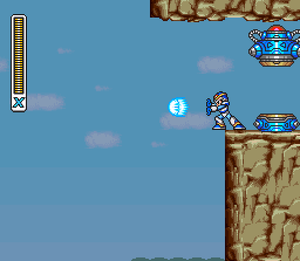 It is not known why X does not yell "Hadouken" in Mega Man X Collection. You can access it in Armored Armadillo's stage after collecting all 4 armor upgrades, all 8 Heart Tanks, and all 4 Sub Tanks (note that you don't have to fill the Sub Tanks). 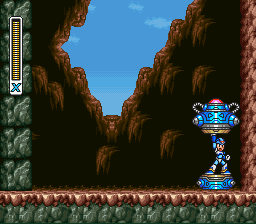 Near the end of the stage, you'll come across the final platform that you can ride through the mine. Ride the platform until it flies off the track and out of the mine; dash jump off the cart onto the wall on the right and get the health capsule. You MUST get the health. Then simply jump off the edge into the pit, and repeat several times. 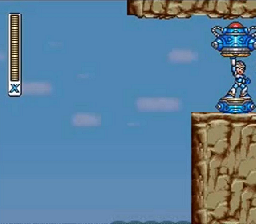 After the 3rd or 4th attempt, an upgrade capsule will appear to the right of the Energy Capsule on a ledge on the top right (note: you do not need full health, full weapon energy, nor full sub-tank energy each time you reach this location; also, you can leave the stage, play another, and come back to finish up the other attempts). Dr. Light will be dressed as Ryu from Street Fighter II. He will give you the Hadoken (used by pushing + ; an alternate button combo is ( or ) then ) which can kill any enemy, including bosses, in one hit, save for the final form of the final boss. Note that you must have full health to use the Hadouken and that there is about half a second "charge" time where you will be temporarily vulnerable. This page was last edited on 29 January 2019, at 02:00. This page has been accessed 688,105 times.